It's time to close the communications loop. I wrote earlier this week about how ABC was using social media to reach out to publishers who promote their shows. I don't know if this is an ABC initiative or a Jimmy Kimmel Show initiative, but I just recieved a FedEx package from "Your Friends at Jimmy Kimmel Live". You're probably curious what they sent me. As I said in the comments of that entry, I'd have been happy with a postcard, as this is completely "above and beyond" in my experience. It turns out I got something better than a postcard. 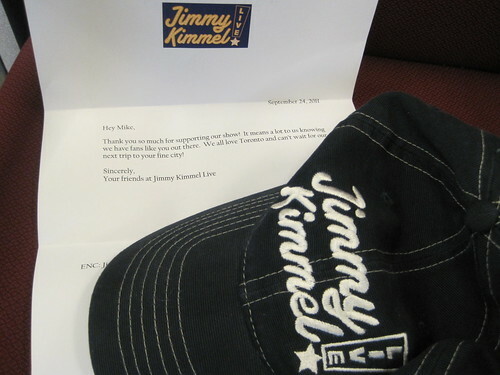 I received a Jimmy Kimmel Live hat and letter. Like I said, this little gesture will carry a lot of weight. Good on ABC for getting it. Well that was certainly nice of them to allow you to further promote their show on your noggin. And, a good quality lid - nice. They are people who really do get it - enjoy. Does Jimmy Kimmel have a time machine? Why is the letter dated September 24, 2011? Yes, I have no life. Damn, we buried the lead! Jimmy Kimmel has a time machine!! !